Passed away at Bunbury Regional Hospital 14.4.19. Dearly beloved wife of Bill (dec). 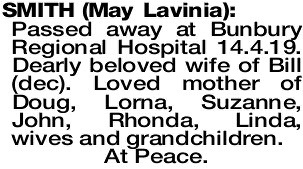 Loved mother of Doug, Lorna, Suzanne, John, Rhonda, Linda, wives and grandchildren.